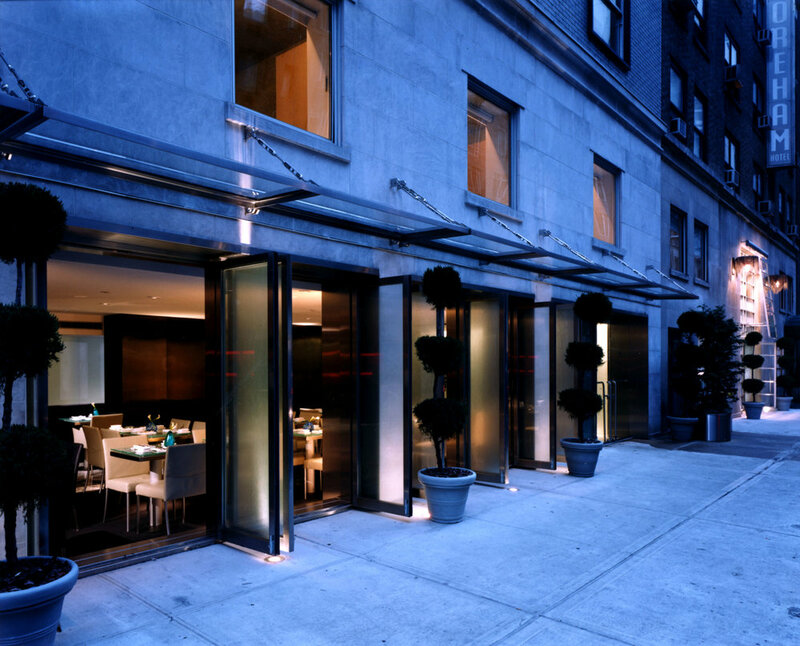 For most of its history, the small New York hotel used its first floor mainly for storage and back offices. The Shoreham renovation transformed the first floor into public space, redesigned administrative areas and quest suites and created a new entry for the restored limestone front façade. Removing room divisions from the first floor created much-needed open public space. The design team devised several simple, sculptural insertions that delineate the lobby’s sub-areas and establish the architectural language used throughout the interior. At the same time, the insertions cloak the interior’s inborn irregularities -- chaotically placed but non-removable structural beams and supports. 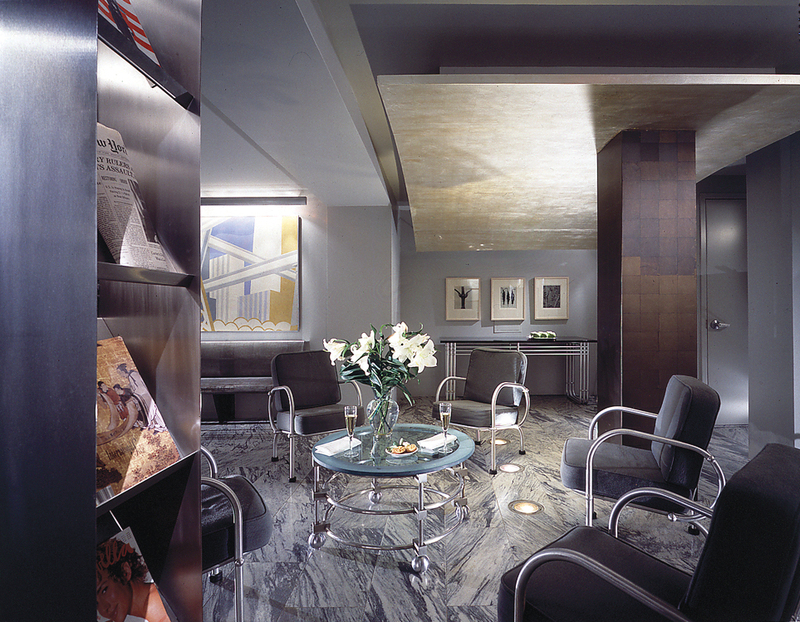 In the lobby, both the 1930's artworks (which include the original Winold Reiss murals rescued from what was once Longchamps restaurant on Broadway) and the insertions (such as the floating ceiling panel in gunmetal leaf and the magazine display case in stainless steel) are lit directly and individually with display lighting. 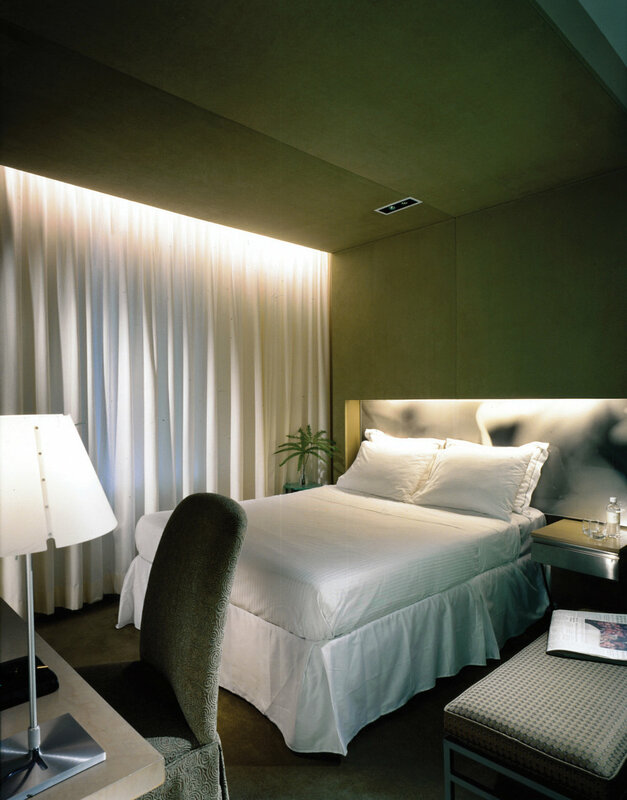 Many of the hotel’s furniture pieces were custom designed in order to achieve maximum space and budget efficiency. Custom designed furnishings, such as the perforated metal “airplane wing” banquette in the lobby, adopt and update the 1930's futurist aesthetic of the Reiss murals. From the same period, Warren McArthur chairs are clustered around a contemporary table. Custom vanities, sink bases and headboards carry the lobby’s metal and glass through the guest suites to accent the rooms’ palette of warm, neutral fabric and woods. The Shoreham’s front facade has been renovated with contemporary gestures that refer to the building’s art deco origins. Structural steel and powder-coated opal laminated glass canopies and steel mesh draped sconces now mark the entry to the limestone building.